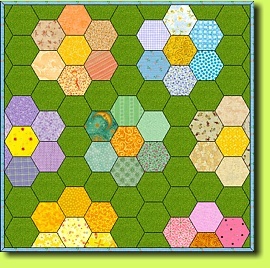 A pattern with a whole bunch of options for classic English Paperpiecing. The perfect take along projekt for travel, vacation and any waiting time. 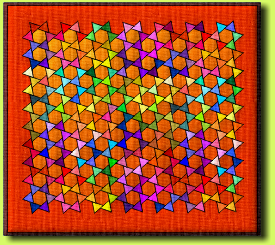 The special alignment of the hexagons and triangles lets the pattern elements interlock and build an endless chain. According to your color choices and how you use them different designs may occur. You will sew by hand using the traditional methoid of English Paperpiecing - but with a special twist. 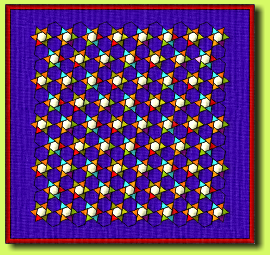 This pattern is particulary suitable for scrap quilts. 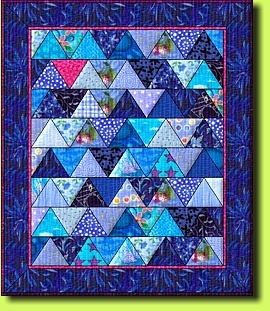 Jelly Rolls up from 2½" are great for cutting the triangles and on top of that they may already provide a color run. All you need is your regular hand sewing equipment, no special tools necessary. Included are all original sized drafts both for "Kamen Weave" and "Starry Sky" in a user-friendly layout. In addition you get detailed sewing instructions from cutting to finishing the top. And as icing on the cake there are two plastic templates for an accurate outcome. Web-Extra: By request registered European customers will receive a pdf-file containing all templates for endless printing on your own printer. 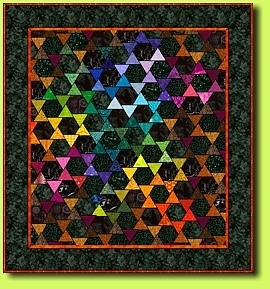 Large filler hexagons give the impression of a starry sky. Playing with double color gradations. 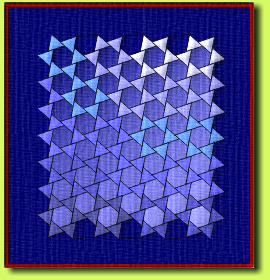 The name "Kamen Weave" is a variation on "Vienna Weave". This is a caning pattern that was and is common in Vienna for caning chairseats, hence the name Vienna Weave. Even today you can find chairs with this pattern in coffee houses in Vienna, Austria. 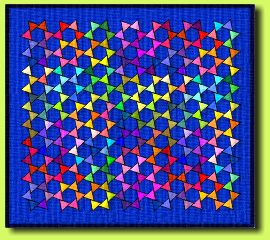 As I don't live in Vienna but in a little town called Kamen I've named my pattern "Kamen Weave". Have a look at the matching patterns Willie and Louise. An acrylic cutting template with instruction is available for efficient rotary cutting of many triangles. Additional tips are included. After removing the foil the template is crystal clear. (1) Plus shipping: Germany 1,90 €, worldwide 3,90 € .